The Battle of Stones River or Second Battle of Murfreesboro (in the South, simply the Battle of Murfreesboro), was fought from December 31, 1862, to January 2, 1863, in Middle Tennessee, as the culmination of the Stones River Campaign in the Western Theater of the American Civil War. 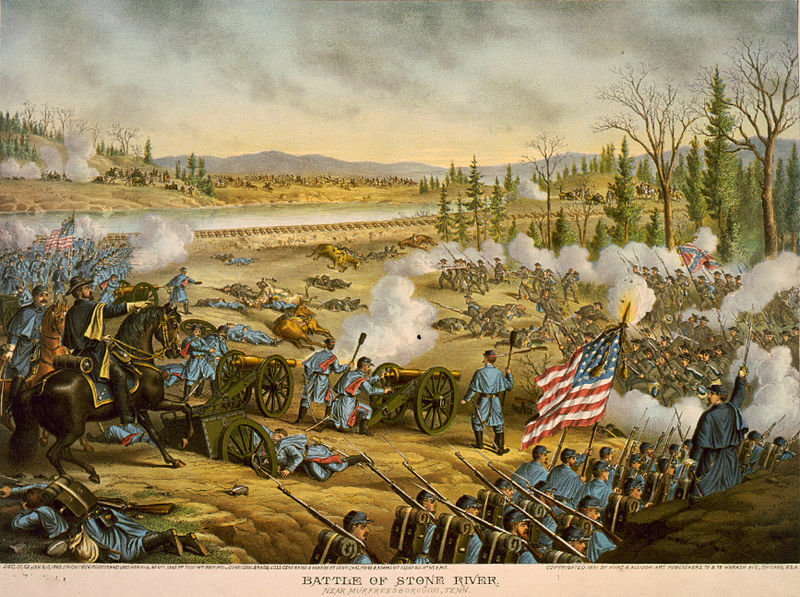 Of the major battles of the Civil War, Stones River had the highest percentage of casualties on both sides. Although the battle itself was inconclusive, the Union Army’s repulse of two Confederate attacks and the subsequent Confederate withdrawal were a much-needed boost to Union morale after the defeat at the Battle of Fredericksburg, and it dashed Confederate aspirations for control of Middle Tennessee. 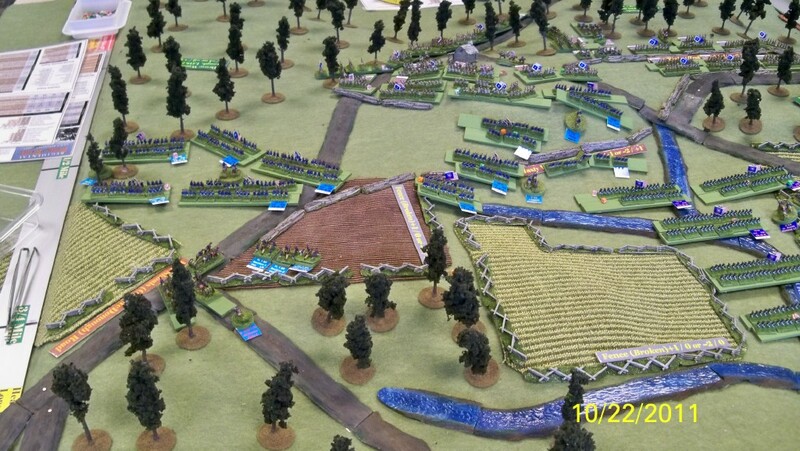 Now, 150 years later, the Tin Soldiers of Antwerp, a long-time gaming club in Belgium, will present a miniature wargame of the Battle of Stones River using the popular Johnny Reb III rules set. Thousands of scale soldiers will be used on a massive playing surface in this multi-day megagame. Registration has now opened (for a modest 20 euro fee) for this international event which attracts wargamers from across western Europe as well as a handful from the United States. For more information, as well as many photos of past megegames (including Gettysburg and Antietam) lick on the link to the club’s website for the event. Midwestern wargamer and scenario designer Lowell Hamilton has contributed another well crafted regimental-level ACW scenario for Regimental Fire & Fury. This one covers the July 1864 Battle of Bald Hill (pictured above) from the Atlanta Campaign. The scenario appears in Issue #34 of the Charge! newsletter published each quarter by Debi and Scott Mingus of York, Pennsylvania, as a courtesy to the membership of the Johnny Reb Gaming Society. Lowell has produced full-color labels for each unit in the battle. Note the labels in the photograph of the terrain table shown above. These labels help identify the regiment or battery, as well as key commanders and leaders, and provide information on strength, morale, etc. as a playing aid. They are color-coded to help easily identify which brigade each regiment belongs with on the table (for command and control, etc.). Download the printable Excel file by clicking the link below.